Adding garlic to a dish can seem like more hassle than it's worth! Who's got time to painstakingly peel the paper off every single garlic clove? 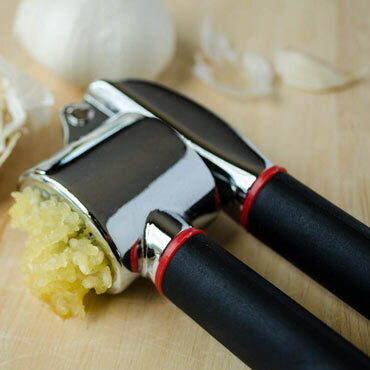 Fortunately, whether you grow your own garlic or pick up fresh bulbs from the store, this professional garlic press takes the hassle out of adding garlic to your dishes. You don't need to peel the skin off individual cloves; just place them in the press, squeeze the handle, and you'll force the garlic through a grid of small holes. It leaves the skin and bitter center stem behind! What's left is a lighter, more delicate garlic flavor that will brighten up sauces, soups, casseroles, salads, and more.